ThermalTake shows off the Frio Advanced, a new CPU cooler that supports all of AMD's and Intel's contemporary platforms, including the upcoming LGA2011. The cooler features five 6mm direct-touch heatpipes, an aluminium fin array, and two 130mm PWM fans with a noise level of 21 to 44dBA. The cooler measures 130.6mm x 122mm x 159.2mm (L x W x H) and weighs 954g. Pricing and availability is unknown. Thermaltake, the leader and pioneer in PC thermal solutions, a worldwide designer and supplier of high-performance components to the PC gaming hardware market, with “delivering the perfect user experiences” as our mission and carrying the corporate vision of “building Thermaltake Technology into a cultural brand for the enjoyment of entertainment, e-Sports, technology and lifestyle.” This October, featuring the Thermaltake Frio Advanced CPU cooler - a CPU cooler that incorporated some of the most up-to-date CPU cooler technologies and persevered the greatnesses from its predecessors of Frio and Frio OCK which not only creating a new phenomenon for overclockers but also set another signature for the Frio Series. 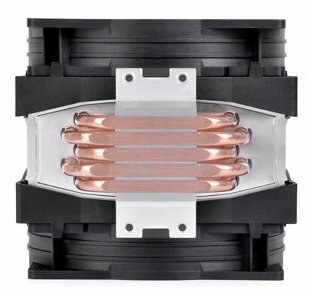 Unlike the traditional welding between the heat-pipe with the heat-sink which created extra welding points acting as heat collectors on the heat-sink, the Thermaltake Frio Advanced consolidated the most up-to-dated CPU cooler technology using mechanical assembling on the heat-pipe with the heat-sink which provides a precise and direct contact for flawless heat transmission from the CPU to the heat-sink. Plus, the 5 x Ø6 mm heat-pipes with direct touch to the CPU surface and high density aluminum fins allow larger surface area that not only increased heat conductivity but also grant for a better heat dissipation. 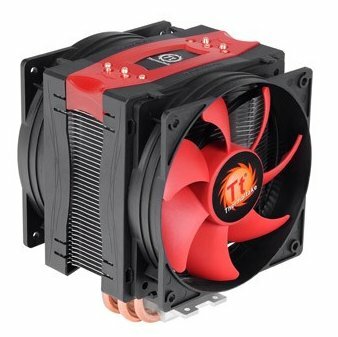 Moreover, the Thermaltake has also incorporated the Pulse-width modulation (PWM) technique to control the speed of the Frio Advanced’s dual 13cm fans from 800~2000 RPM in favor of a smarter fan noise management for overclockers. The Thermaltake Frio Advanced CPU cooler has preserved some of the great functionalities from its predecessors of Frio and Frio OCK like the dual 13cm over-clocking of high performance red bladed fans which generate excellent cooling power, tool-less fan installation provides great convenience, vibration-absorbent gaskets decrease noise during operation and all-in-one back-plate design that support the up to latest Intel LGA 2011 and all AMD platforms for overclockers. The Frio Advanced CPU cooler is one true CPU air cooler which support up to 230w that Thermaltake could offer to the overclock enthusiasts.